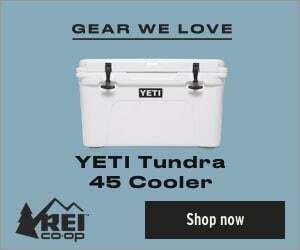 Looking for an easy way to start a fire? Learn how to easily and cheaply make fire starters at home and come well prepared for your next outdoor adventure! I tried a dozen different methods, to see which ones worked best. 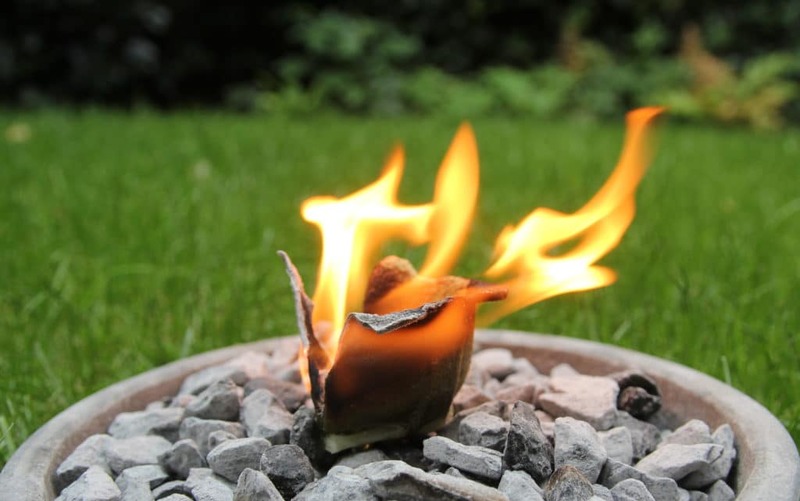 Below you will find step-by-step guides for 7 different fire starters that you can easily make at home with materials you probably already have laying around. 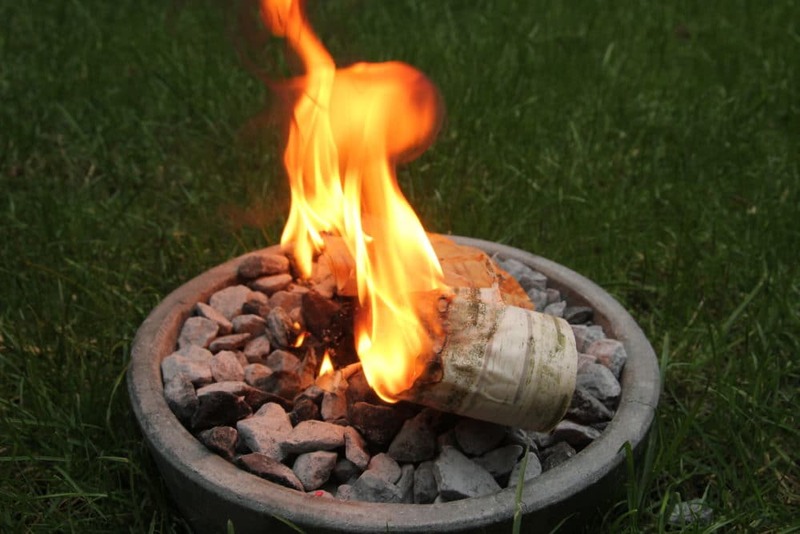 Do you know another awesome way to make a fire starter? Leave a comment below, with your tips and tricks. 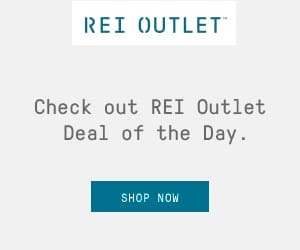 Have a friend that could find this article helpful? Be sure to share this article with him/her, thanks! 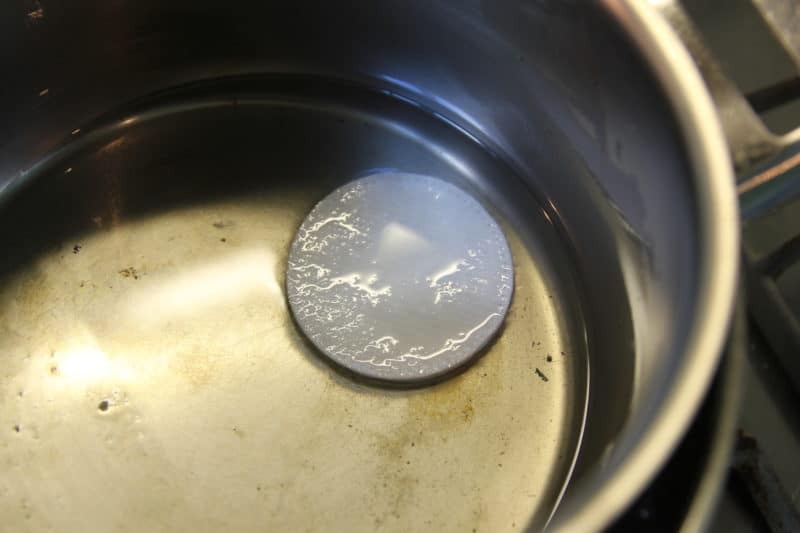 *I used a large pan filled with 2 inches of water and an old smaller pan from the thrift shop to melt the wax in. Step 1: Start by taking out the wick and remove the metal casing from the tea light candle. We only want to use the wax. Step 2: Melt the wax using a double boiler set up, or use a specialized melting pot for making candles. Wear some safety goggles and protect yourself and your clothing with an apron, as melted wax is very hot and can be hard to get out of clothes. 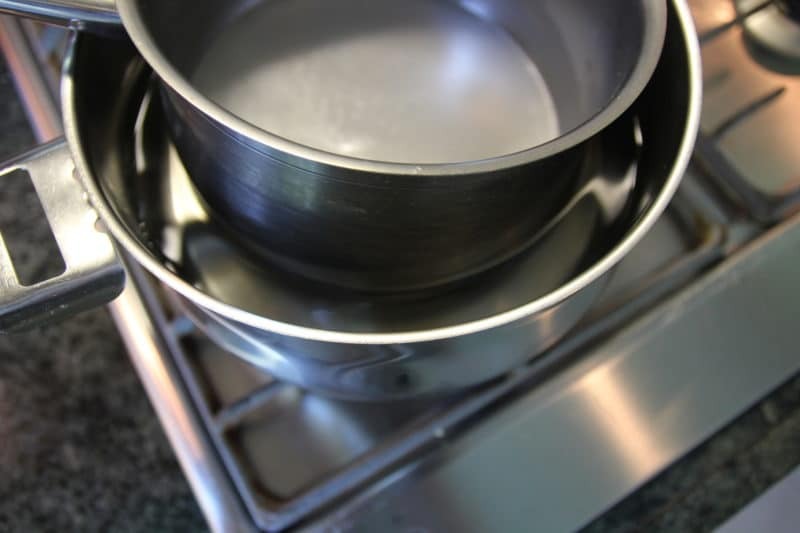 For safety, wax should always be melted in a double boiler setup so it doesn’t exceed 212ºF / 100ºC. Step 3: Once the wax is melted, place a cotton pad on the bottom of the pan. Leave it in there for a couple seconds so it can soak up some of the wax. Next, take it out with a spoon or long tweezers and place it on a sheet of wax paper to cool down. You’re all done! 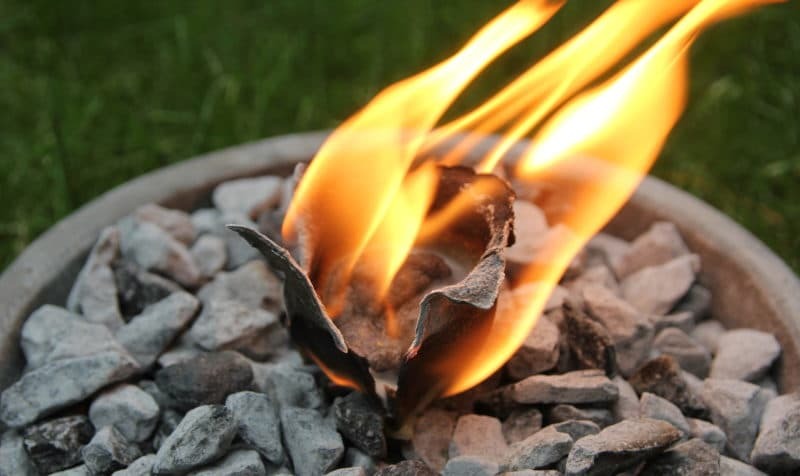 To light it, simply break the pad open a bit to expose the cotton fibers and light it with a match or fire steel. It will burn for roughly 5 min. You can store the pads in a waterproof bag or box and take them with you on your next outdoor adventure. Don’t feel like messing with hot candle wax? 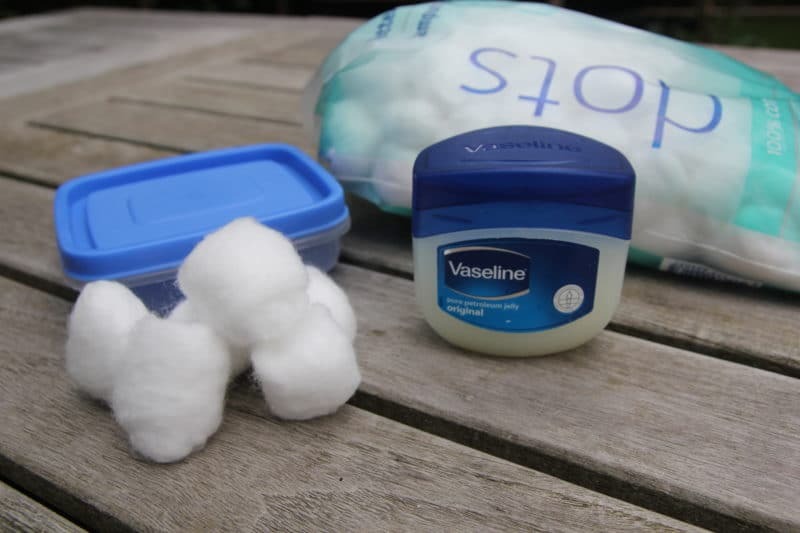 Try this super easy method: vaseline + cotton balls. 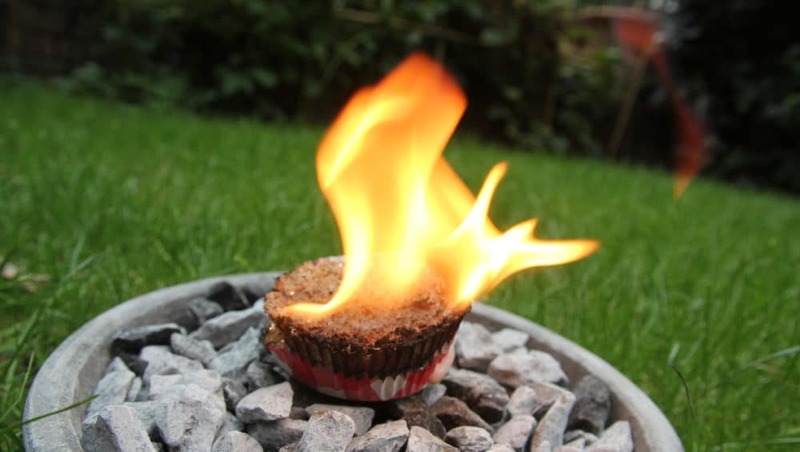 This simple fire starter is great to make with kids and it only takes about 30 seconds. 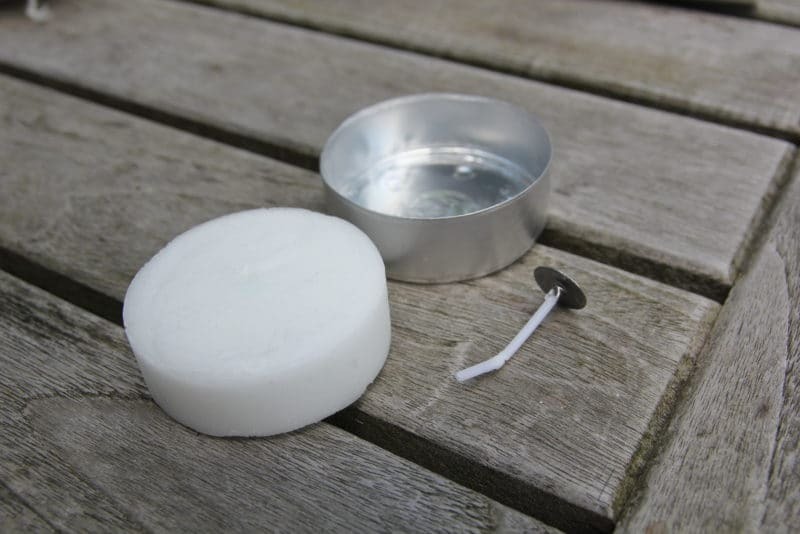 The magic ingredient, petroleum jelly turns an ordinary cotton ball into a lightweight fire starter that burns for roughly 4 minutes and only costs a few pennies to make. 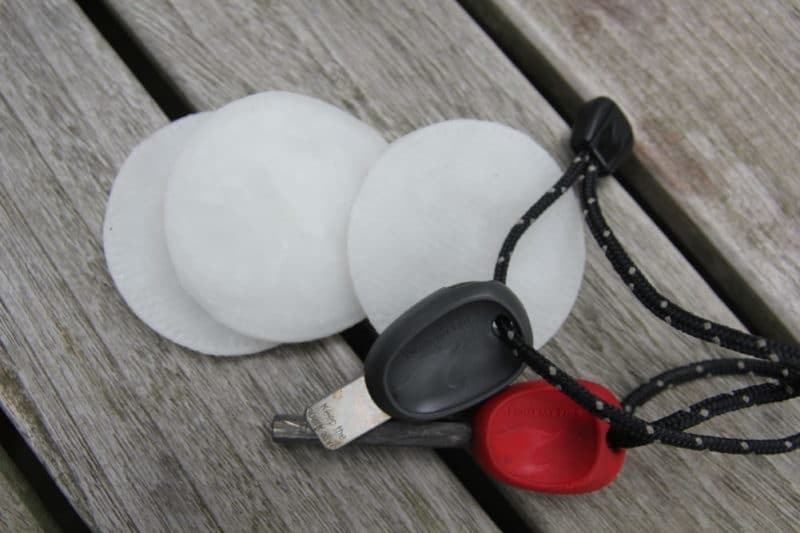 All you have to do to make these is the following: Take a cotton ball, scoop up some Vaseline and roll the ball between your hands. You want the ball to be well covered. 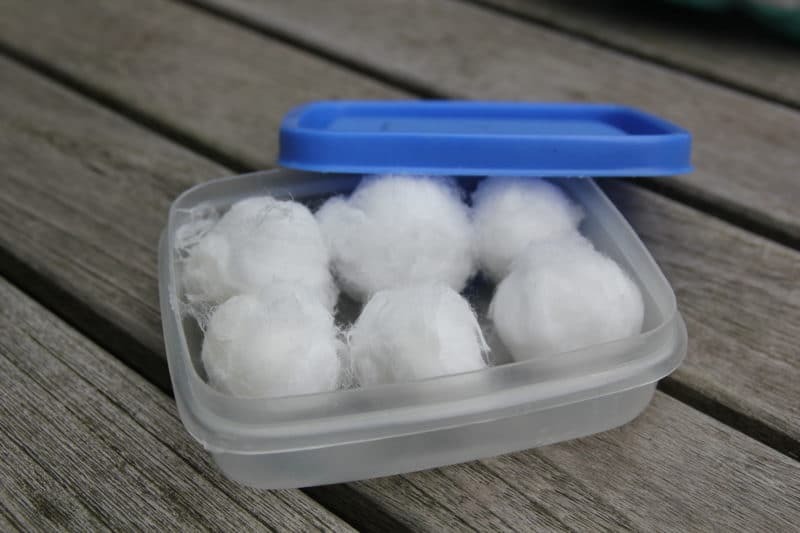 If you put on enough Vaseline, the cotton balls will actually become waterproof. That’s it, your fire starter is done! 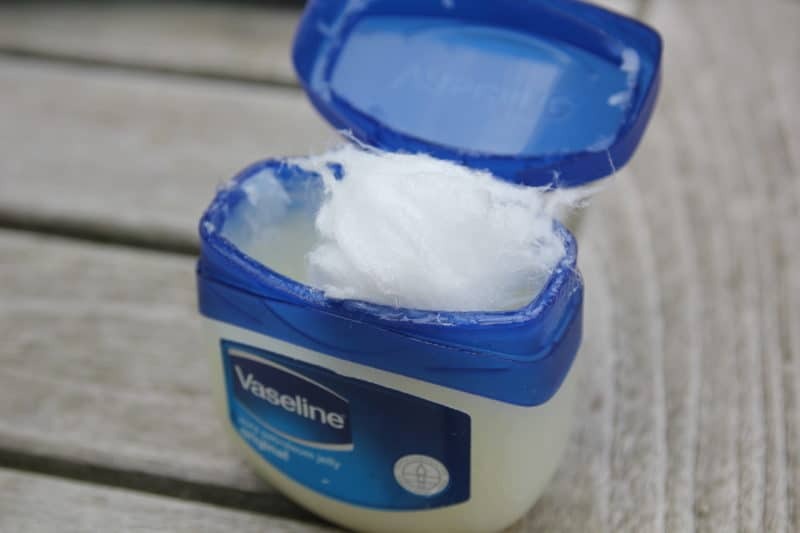 Just store them in a small container, so you can easily take them with you without everything getting covered in Vaseline. This fire starter burns about as long as the cotton pad method mentioned above but does produce a slightly smaller flame. To light it with a fire steel, you will have to pry the ball open a bit, to expose some dry fibers. Go check your dryer now and see if you can find some dryer lint because we will need it for this fire starter. Not all people like this method, as it’s quite messy and produces a fire starter that’s a bit heavier compared to other methods. You won’t be able to light this one with just a spark, so be sure to bring some matches or a lighter in your survival kit. It does have some advantages though. This dryer lint fire starter is waterproof and will burn for 10+ minutes! 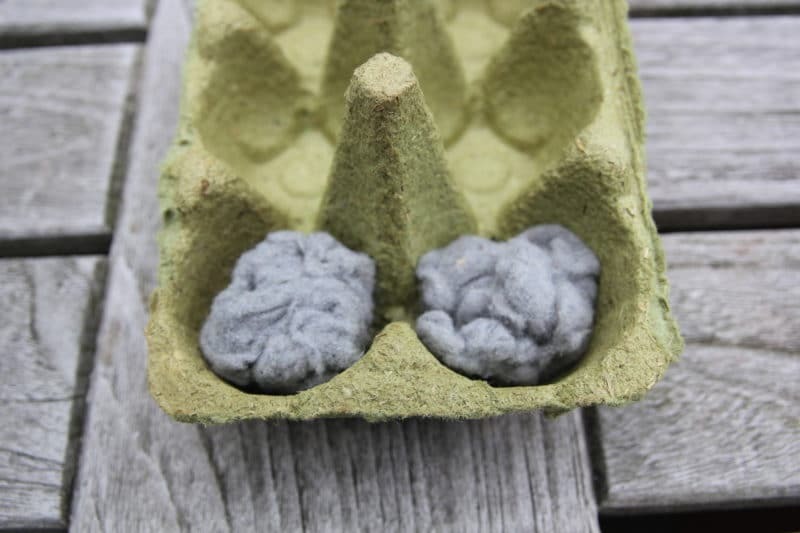 Step 1: Fill up your egg carton with balls of dryer lint. I only had enough for two compartments this time. Step 2: Take out the wick and remove the metal casing from the tea light candle. We only want to use the wax. Step 3: Use the same double boiler method as we used for the cotton pad fire starters to melt the wax. Step 4: Pour the melted wax over the dryer lint and fill up the compartments. It’s best to place your egg carton on some wax paper to protect your countertop. Let the wax cool down. 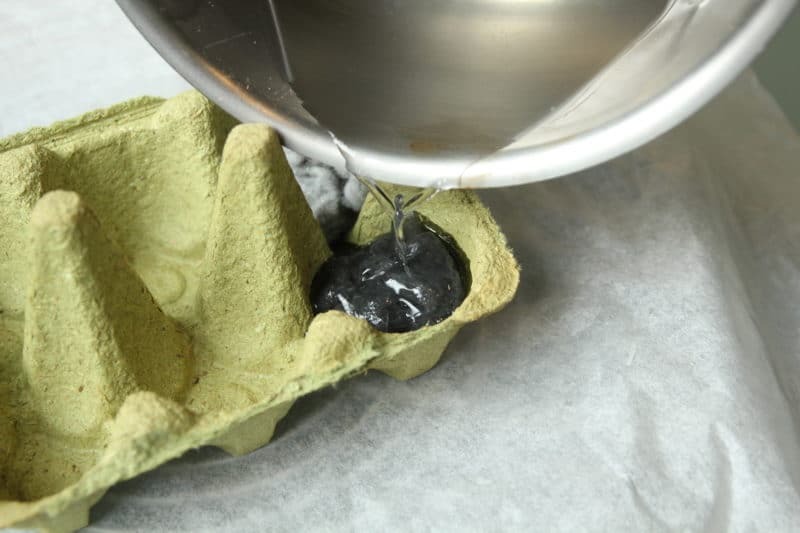 Step 5: When the wax has completely hardened, use a knife or some scissors to cut the egg carton into cubes. You can also leave it together if you want to bring multiple fire starters on your trip. Light the edges of the carton to start the fire starter burning. 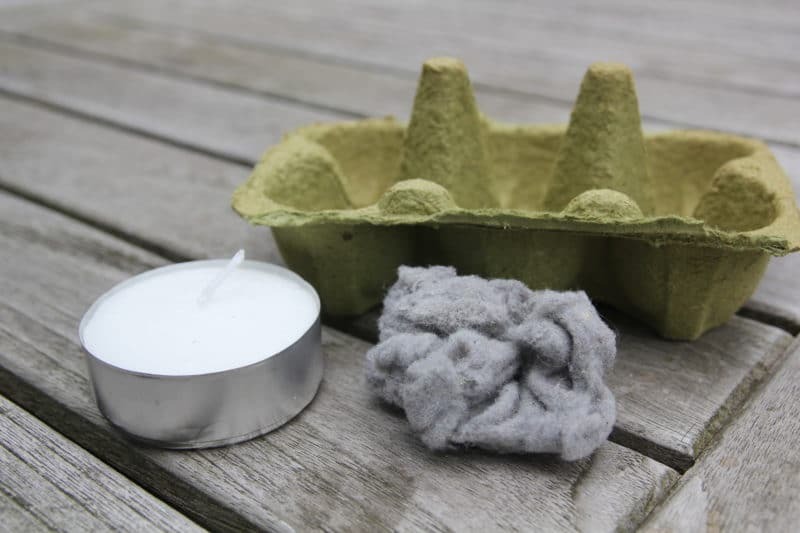 The paper will help to ignite the wax and dryer lint. This dryer lint fire starter produces quite a large flame and will burn between 10-20 min, depending on how much wax and dryer lint you used. Jute is a great fire starter on its own but doesn’t burn very long. 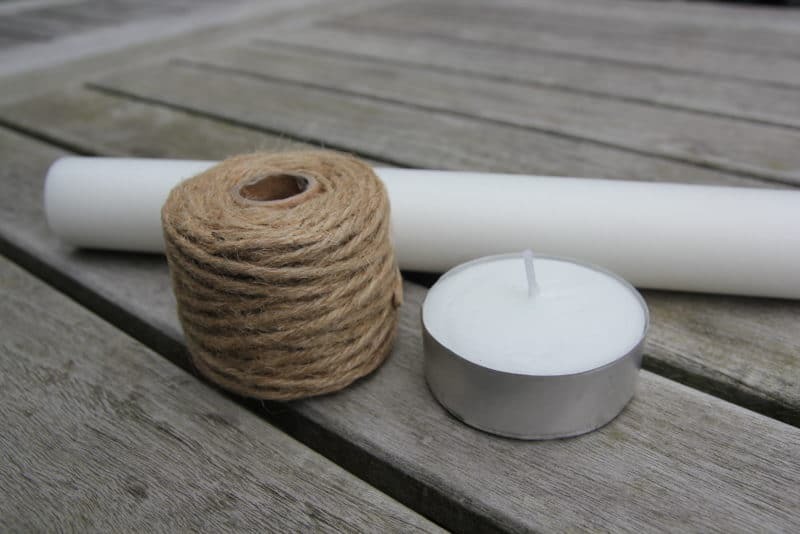 By dipping short pieces of jute twine in wax, we can create a waterproof fire starter that is super light and burns for 2-5 minutes. It’s best to use jute twine that is made of multiple strands, I like to use 4-6 mm twine. 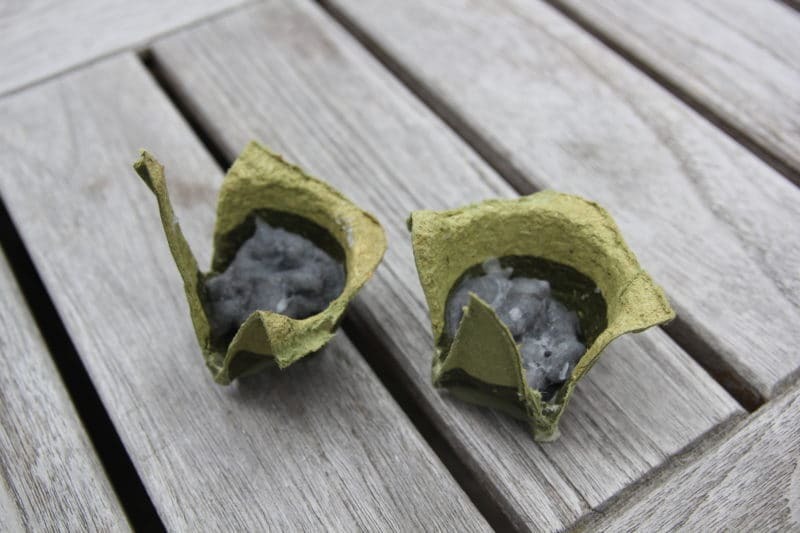 Melting wax might seem like a big hassle, but this method allows you to make 20-30 fire starters in one go. 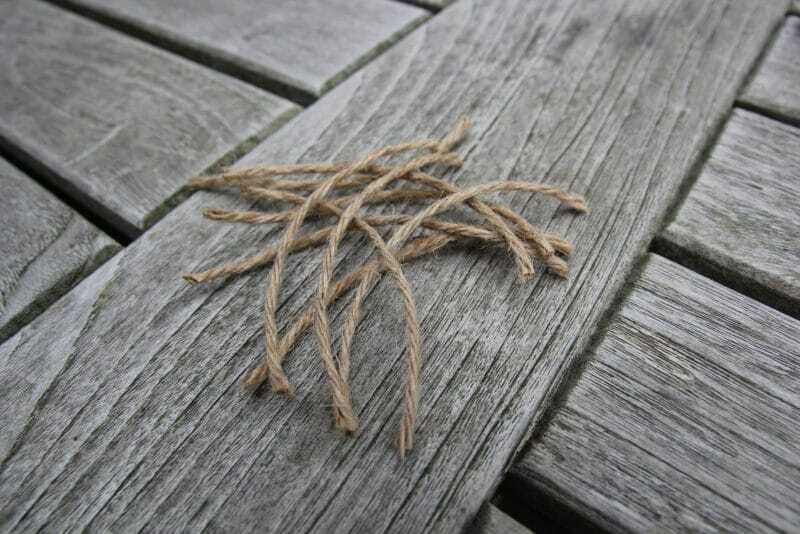 Step 1: Cut the jute twine into 4″ (10cm) pieces. If you want longer burning fire starters, just make them longer. Step 2: Disassemble the tea light candles, we only want to use the wax. 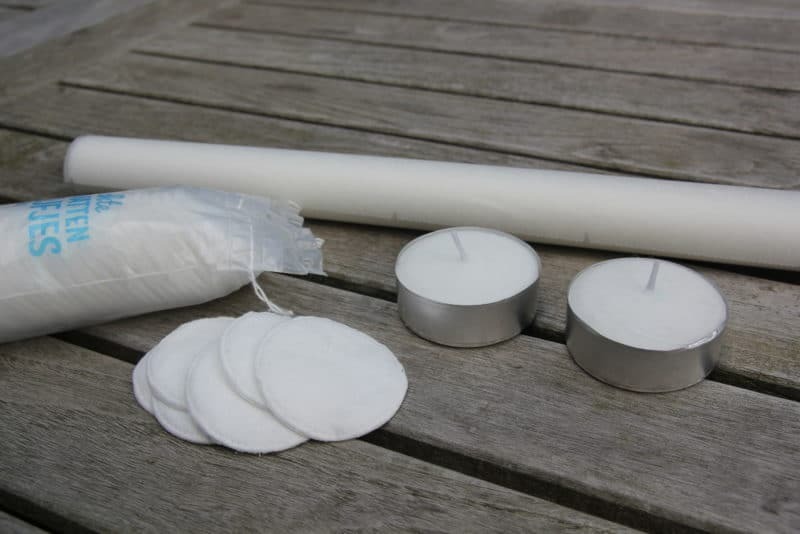 If you have old candle stumps laying around, you can use these as well. Step 3: Use a double boiler setup, see details above, to melt the wax. 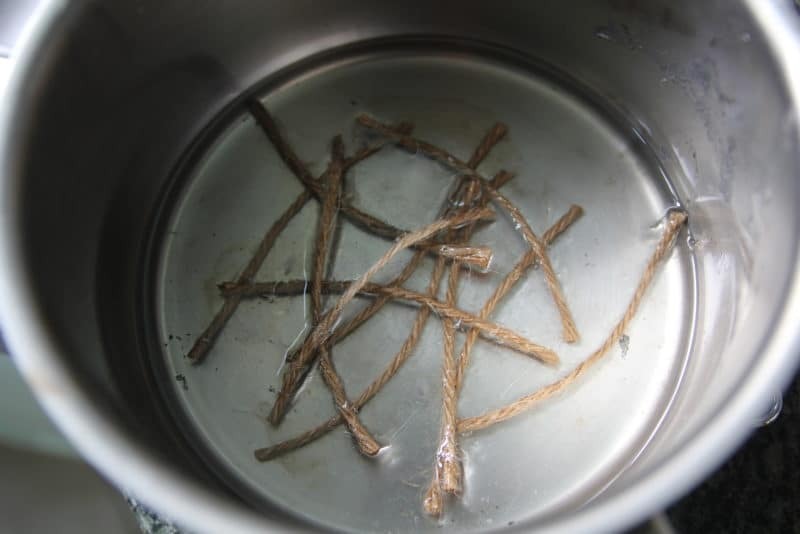 Step 4: Put the pieces of jute twine in the melted wax and let them soak for 1-2 minutes. Use long tweezers, pliers or a fork to take them out and place them on a sheet of wax paper to cool down. Put them in the fridge if you want them to cool down faster. 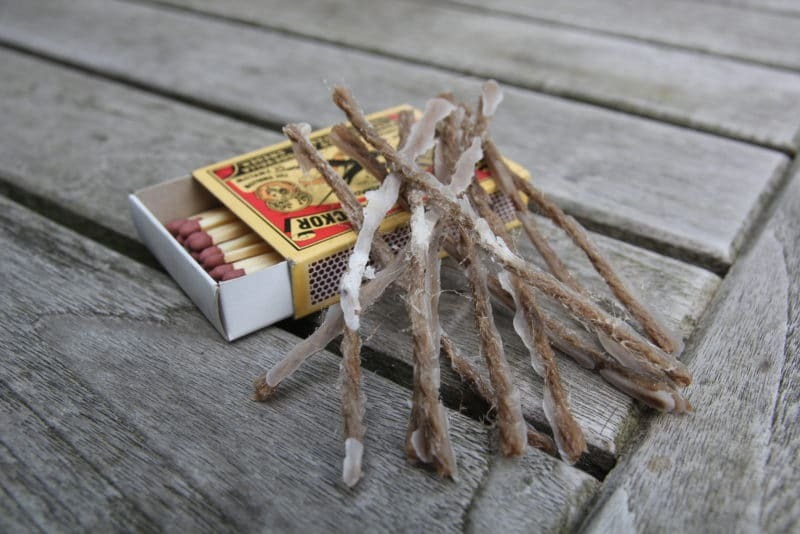 To light your freshly made fire starters, try to pluck the piece of jute apart. Thinner strands will more easily catch fire. 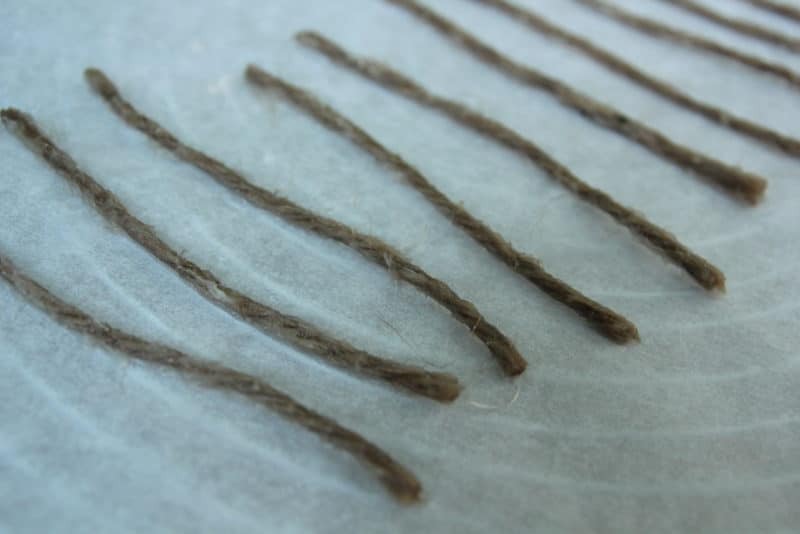 If you split one of the ends into fine strands, you will be able to start these with a spark from a fire steel. I’m personally a big fan of the Light my Fire FireSteel. Depending on the thickness and length of jute you used, these fire starters will burn for 2-5 minutes. 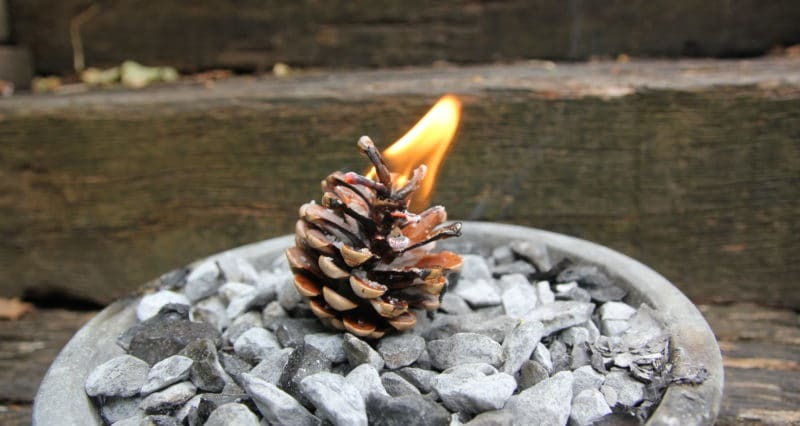 Pinecone fire starters not only smell and look good, they also work well and make great gifts. You can usually find pinecones in the spring or late summer. I picked mine from the ground in early August this year. 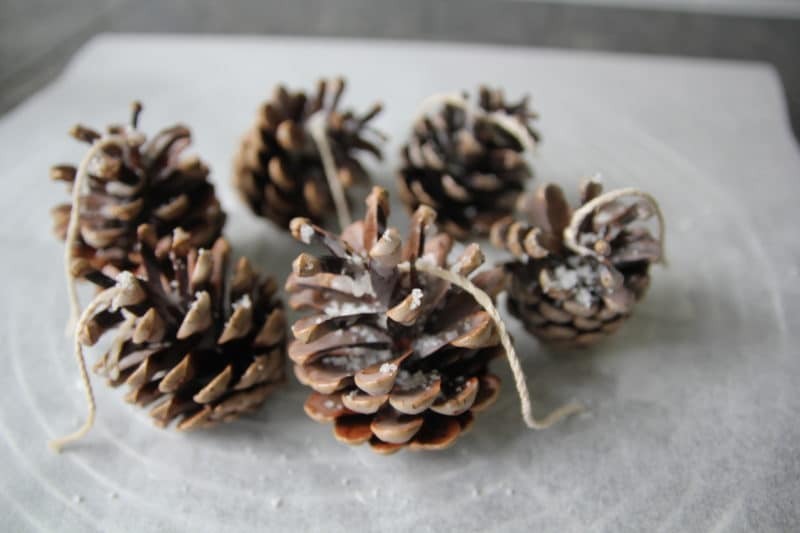 All you need to make these is some string, wax (use tea light candles or some old candle stumps), wax paper and some pine cones of course. 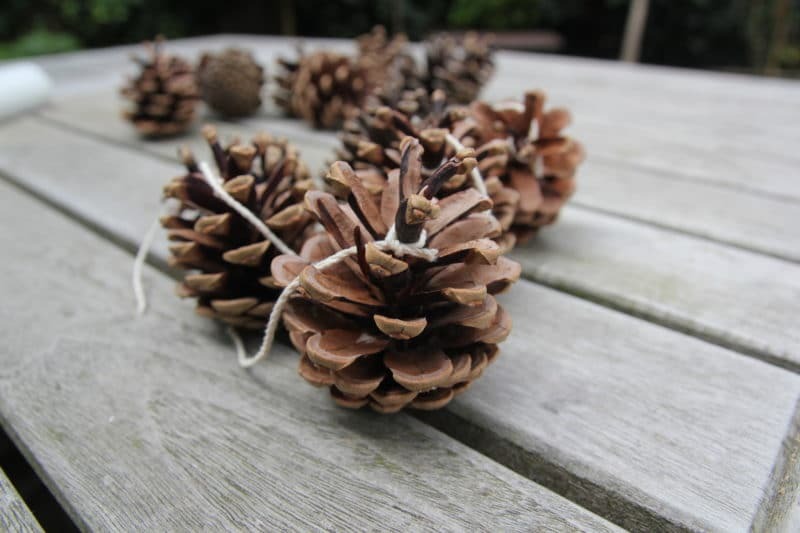 Step 1: Start by tying a short piece of string around the top of the pinecones. This will be used to hold the pinecones while dipping them in the hot wax and also serves as a wick to light them. Step 2: Melt the wax using a double boiler setup. You can use wax dye, to give the pinecones some beautiful colors. Pinecones do smell great of course, but you can always add some fragrance oil if you prefer a different smell. Step 3: Dip the pinecones in the melted wax, you can use a spoon to help cover them. You will probably find that you can’t get a thick enough layer by just dipping them once. Let the pinecones cool down on a sheet of wax paper for roughly 15 minutes. Then come back to add a second layer, by dipping them in the wax again. You can do this 2-4 times, to build up a good layer. If you want the final layer to be shiny, make sure the wax is extra hot. I added a bit of salt as decoration. You can trim the piece of string a bit if you left it long while dipping. 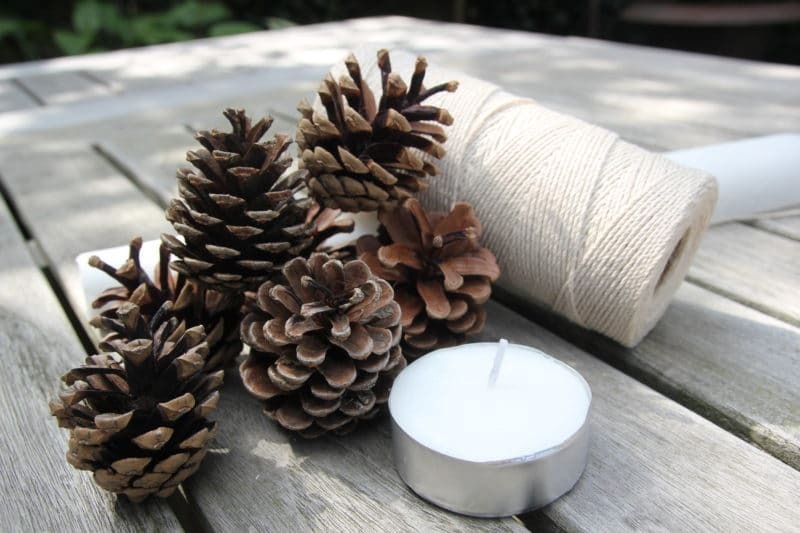 If you tie the string in a loop, you can hang the pinecone fire starters as decoration around the fireplace. 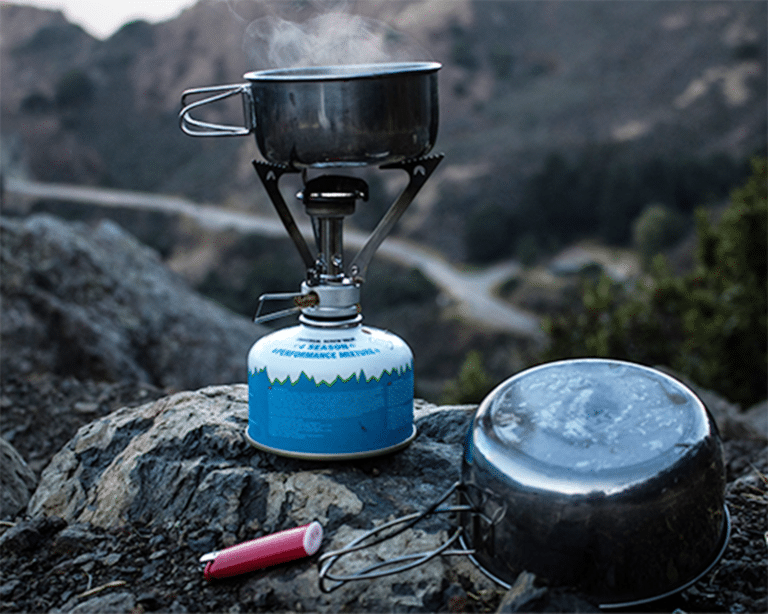 What to do if you’re out camping and didn’t prepare any fire starters at home? Well luckily for us, nature does provide us with some really good fire starter that you might not know about. Birch bark is one of them. The bark from birch trees has been used for thousands of years to start fires. The outside layer of bark from these easy to recognize white-barked trees continuously renews itself and often falls down in thin layers. These thin strips work extremely well to start a fire, even when wet. The trees in front of my house are birch trees, so I can always easily collect some bark before I go on a camping trip. 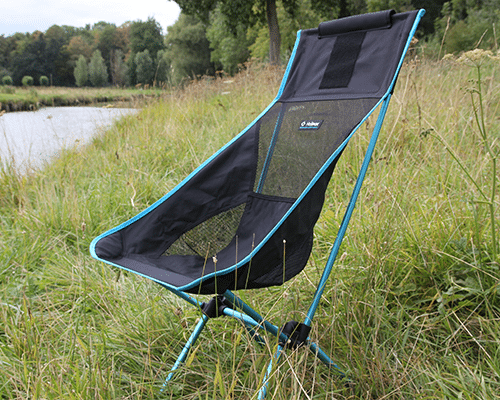 But most often you can also find them when you are out hiking or camping. 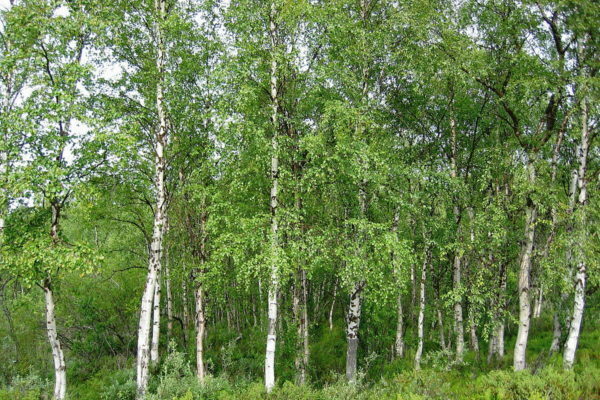 You can find birch trees all over Europe, Scandinavia, North America and Canada. They are quite easy to recognize but I do recommend taking a tree identification book with you when you’re out exploring. I quite like this one from Amazon, which shows you how to recognize trees by looking at their bark only. 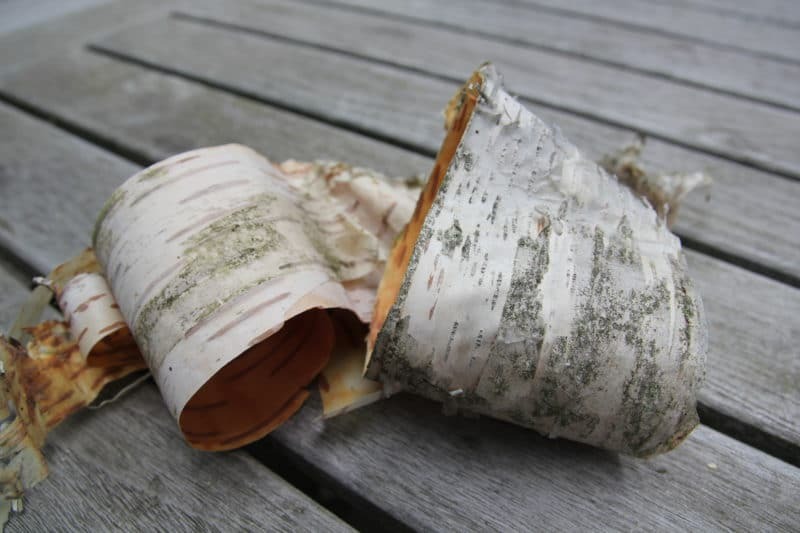 Birch bark burns quite quickly (30 seconds or so), but does produce a very large and hot flame. If you position it under some small kindling, you should have a nice fire in no time. 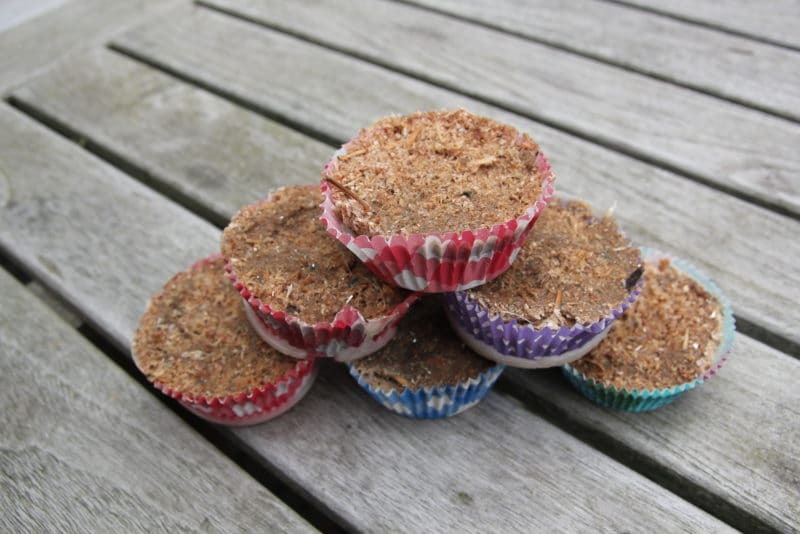 These cupcake/muffin sawdust fire starters are great for camping or starting a fire in your fireplace at home. They are not really lightweight, but can burn for roughly 15 minutes! That should be long enough for anyone to get a fire going. We will be needing some baking supplies, namely a muffin pan and paper liners and some sawdust. For wax, you can use some old candle stumps or just melt some cheap tea light candles like I did. Don’t have any sawdust? Try asking your local woodworker/carpentry shop. Shredded paper will probably also work fine, but might not burn as long. 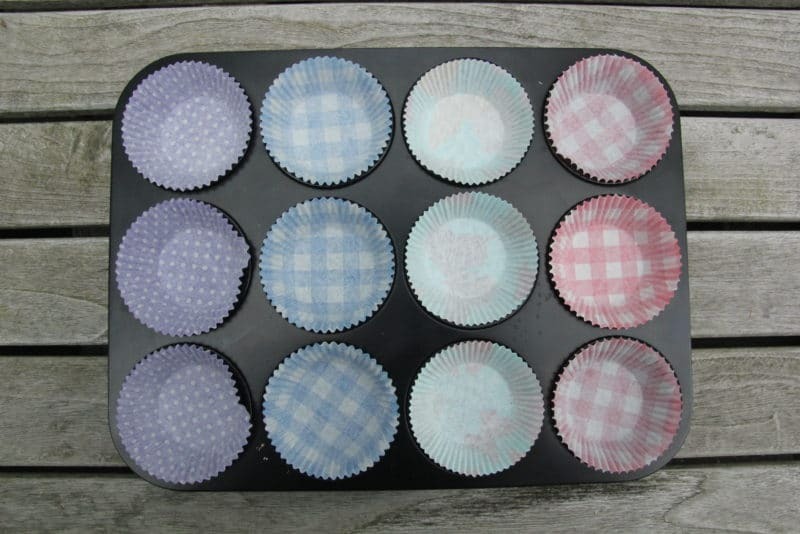 Step 1: Start by placing the paper cupcake liners in the non-stick muffin pan. Fill them up roughly 3/4 with sawdust. Step 2: Next we will need to disassemble the tealight candles and melt them in the same way as we did before: with a double boiler setup. (see above for more details). 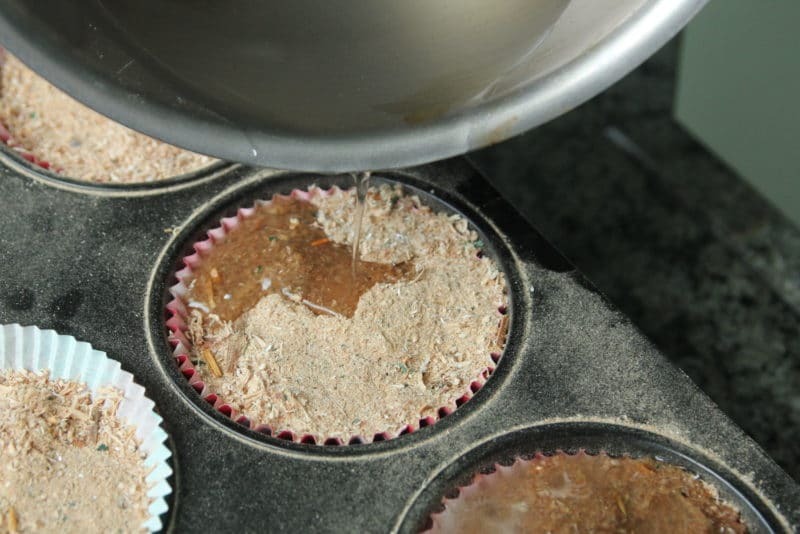 Step 3: Once the wax has melted, place the muffin pan on a sheet of wax paper (for accidental spills) and slowly pour the wax over the sawdust. The sawdust will soak up quite a lot of wax. 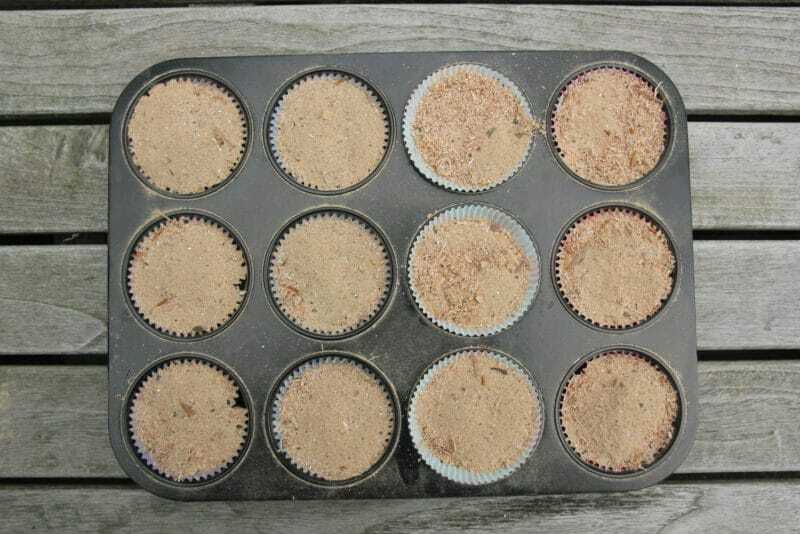 Another way to make these is by adding the sawdust directly to the melted wax in the pan. This way the sawdust and wax get mixed a bit better, but I find it a bit messy. Filling the paper liners with the sawdust/wax paste is also a bit more work. Step 4: Put the muffin pan in the fridge or let them sit for roughly 15 minutes to cool down. 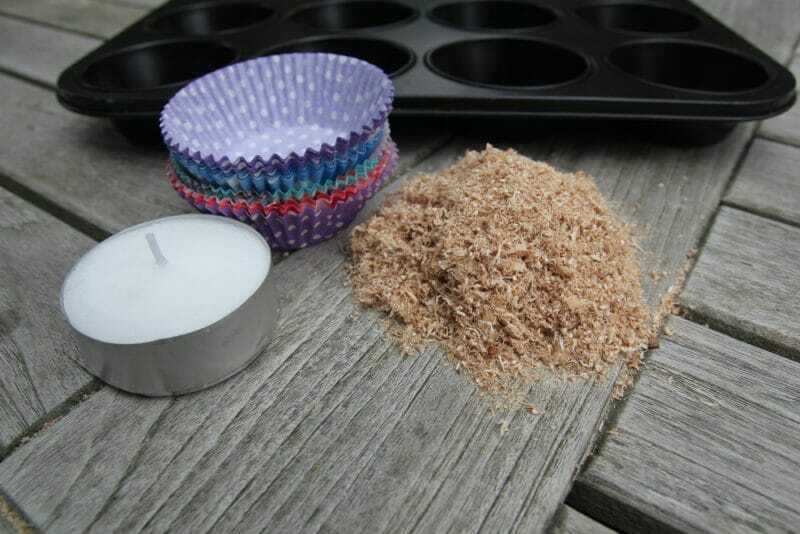 You can light these sawdust muffin fire starters with a lighter or matches. Light the edge of the paper, this will ignite the rest of the sawdust/wax mixture. 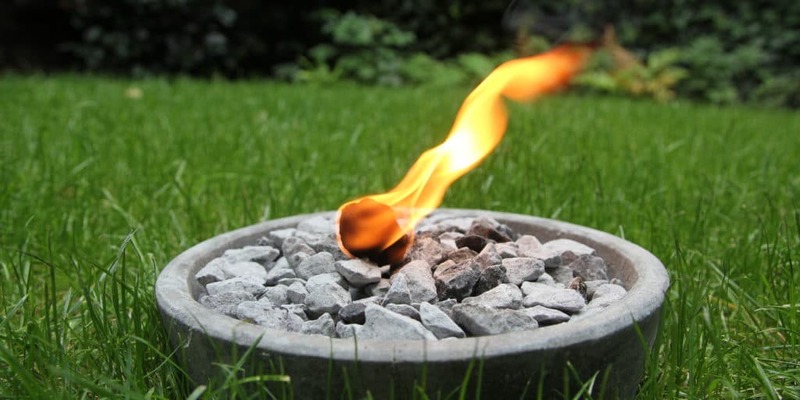 Now you know 7 different ways to make fire starters at home. Please leave a comment down below if you have any suggestions, questions, or tips and tricks you would like to share. Liked this article? Please share it with your family/friends that could find this helpful, thanks!